The feeder cattle market continues to hold reasonably well as we move further into fall. As I write this on October 18, 2017, fall CME© Feeder Cattle futures contracts are trading in the low $150’s with spring contracts in the mid-$140’s. The fed cattle market did seem to find a bottom in early September and has moved upward from there. This was welcome news across the entire complex. Corn prices have been pretty steady since last month. USDA raised their corn yield forecast slightly in October and the current is for nearly a 14.3 billion bushel crop. 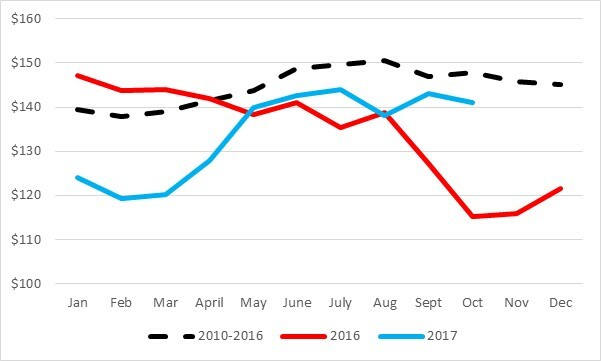 Locally, calf prices are not showing their usual seasonal decline. Fed cattle and corn prices are part of the reason for this, but I also think the good fall weather is at play. October is a typical weaning time for most spring calving operations. However, most producers have had excellent fall moisture and pastures are growing exceptionally well right now. This has likely delayed the fall calf run as many have likely chosen to wean later or may be keeping calves post-weaning to take advantage of inexpensive gain on grass. Also note that I usually don’t include the current month in the charts below, but since I had two full weeks of prices, I chose to include October this time. When I show those charts next month, October will include the whole month, so expect it to change somewhat. I would still expect calf prices to decline somewhat once we start seeing larger numbers of calves move through the system. Also remember that stockpiled pasture, for which this has been an excellent year, also supports calf prices by lowering backgrounding costs early in the program. Pretty soon, feed costs will be driving those calf values. The good news is that feed costs are lower and the spring feeder cattle board is much stronger than it was this time last year. 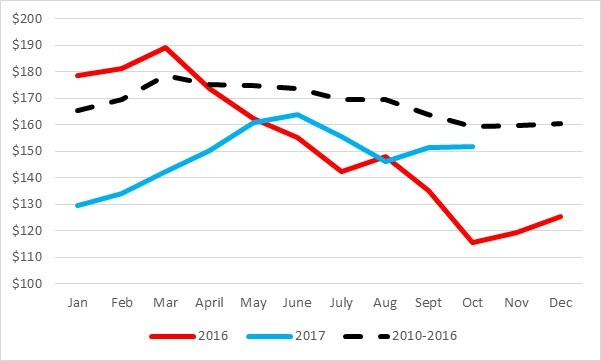 So, my best guess for this fall would be for calf prices to bottom in November or early December, but remain significantly above where they were last fall. Posted by Smith at 8:03am October 19, 2017 Posted in Economics. Bookmark the permalink.